First, Happy Holidays to all of you!! 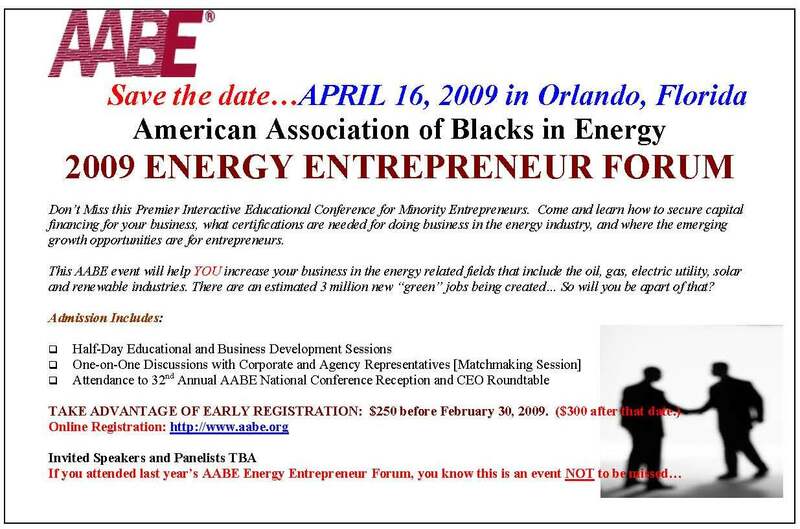 Some of you may be aware that we have had a lot going on with the AABE Energy Entrepreneur Committee since our last communication. Energy Entrepreneurs are positioned to benefit greatly under the new Obama Administration with its commitment to small businesses and notably those in energy related fields. As importantly, corporations and government agencies will be looking to our AABE organization to help them meet their supply diversity needs. So this is a window of opportunity that both parties (entrepreneur & corporation/gov't agency) should indeed capture! We finalized our long-term strategic plan and have submitted and reviewed it with the AABE Board. Also, we have submitted a Going Forward plan to the Board and obtained approval to proceed with activities immediately such as expanding our entrepreneurs database, generating MOU(s) with private equity firms, and securing funds for grant writing. The efforts by this committee are viewed as key to the overall strategic direction of the AABE organization. It is important more than ever that each and everyone of you become fully engaged! The AABE Entrepreneur Committee plans to resume our periodic conference calls with members and supplier diversity representatives immediately following the holidays. Also, we have established an email for this committee which will be used for our next communication. So please stay tuned and we look forward to seeing you in April! !